All images were taken with a Nikon 35mm camera with a 50 mm lens set at 2.2 f/stop, on a fixed tripod, with 45 secod exposures on Kodak Royal Gold 1000asa print film. Image is also a composite of 2 images. Both were taken on april 9 at 01:45 UT and 01:46 UT respectively. 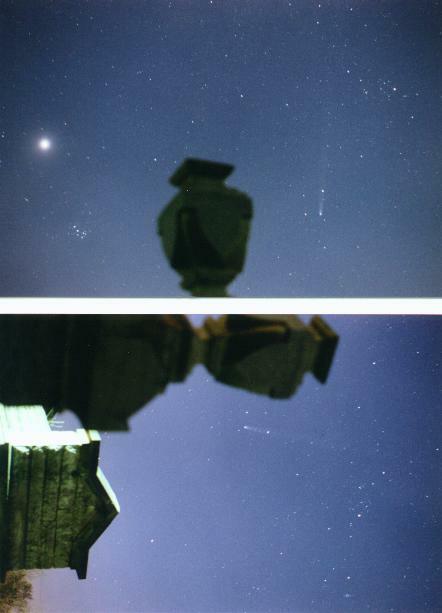 Both images were taken in a cemetary located outside of Terre Haute, Indiana by James C. Wallace II, Student Director of the John C. Hook Memorial Observatory of Indiana State University. In several of the images, Both Venus and the Pleides can be seen along with the comet, as well as a gravestone and mauseleum.